Onion Rava Dosa is a South Indian Dish. This is the easiest dosa that i have ever come across. Very simple and quick to make as there is no need to soak, grind and leaving batter overnight process involved. It is instant recipe and yet very tasty. Good for morning breakfast and with evening tea. This is very simple but needs lot of patience while roasting it in order to get the crispness. Optional - Can use grated carrots, curry leaves and coriander leaves also. Can have it without onions then it is called plain rava dosa. Mix the batter well every time before putting it on a non-stick pan to prevent the accumulation of rava at the bottom. Batter should be very thin like a buttermilk to get the lacy holes. Keep checking the consistency of the batter every now and then and add little water and salt if the batter becomes thick. Use non-stick pan and it should be heated well before spreading the batter on it. 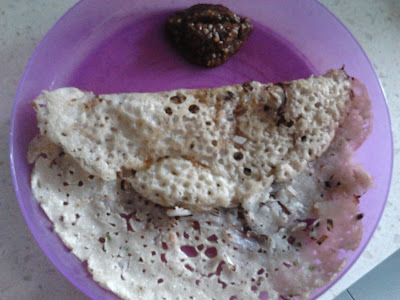 After spreading the batter, roast the dosa in medium or low flame to give crispy touch. No need to roast on the other side as we are roasting it on low or medium flame. Adding ghee to the dosa will give nice taste and have it hot for the better results. You can sprinkle onion before pouring the batter or directly on dosa i.e., on the batter. Apply oil / ghee to it and spread it. The pan should be really hot. When the smoke starts to come from the pan, sprinkle some onions on the pan and reduce the flame to medium. (NOTE : Sprinkle little onions else you might face the problem while removing the dosa). Mix the batter very well and pour the batter onto the pan in a circular movement and spread it well. You can see the lacy holes. (NOTE : If you are unable to see the lacy holes that means your batter is thick or your pan is not hot). Apply some ghee / oil on top and roast it on low or medium flame until it is crispy and golden brown in color. Serve hot immediately with sambar or any type of chutney.